Or, get it for 33600 Kobo Super Points! This thoroughly updated, money-saving self-study set gathers essential exam-focused resources to use in preparation for the latest Certified Ethical Hacker exam. 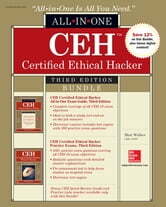 CEH Certified Ethical Hacker All-in-One Exam Guide, Third Edition, provides an in-depth review that covers 100% of the exam’s objectives. CEH Certified Ethical Hacker Practice Exams, Third Edition, tests and reinforces this coverage with 500+ realistic practice questions. 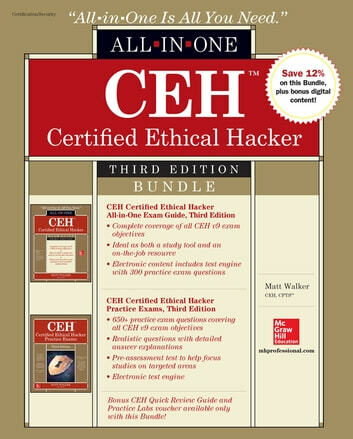 The CEH Certified Ethical Hacker Bundle, Third Edition, contains a bonus Quick Review Guide that can be used as the final piece for exam preparation. This content comes in addition to the electronic content included with the bundle’s component books. This new edition includes greater emphasis on cloud computing and mobile platforms and addresses new vulnerabilities to the latest technologies and operating systems.